GRAVEL, LOUIS-PIERRE (baptized Louis-Joseph-Cyriaque), secular priest, colonizing missionary, and office holder; b. 8 Aug. 1868 in Stanfold (Princeville), Que., son of Louis Gravel, a doctor, and Jessie Bettez; d. 10 Feb. 1926 in Montreal and was interred 18 February in the cemetery at Gravelbourg, Sask., where five brothers and a sister, whom he had persuaded to come and help in his colonizing work, are also buried. Louis-Pierre Gravel, called Pietro by his friends, grew up in Arthabaskaville (Victoriaville), Que. Although his father belonged to its small circle of leading citizens (the best known being Wilfrid Laurier*), Gravel’s large family was never well off and they were in even worse straits after his father’s early death in 1888. Louis-Pierre did his classical studies at the Séminaire de Trois-Rivières and the Séminaire de Nicolet. In the autumn of 1888 he entered the Grand Séminaire in Montreal and he later continued his theological studies at Nicolet. Bishop Elphège Gravel* of Nicolet, who was his father’s first cousin, ordained him priest on 28 Aug. 1892. Louis-Pierre left soon after for New York, where a higher stipend than was supplied in Quebec enabled him to help support his mother, who had been left with eight children still to raise. In New York Abbé Gravel ministered in the French Canadian parish of Saint-Jean-Baptiste from 1892 to 1901, and in the parish of Saint-Joseph from 1901 to 1906. A poet and musician in his spare time, a brilliant preacher devoted to his parishioners, he composed patriotic and religious songs in French, as well as sermons and tracts in English, which were published. He had just been named assistant priest in the suburb of Yonkers when he received a letter dated 28 July 1906 from the well-known Oblate missionary Zacharie Lacasse, requesting him, on behalf of Archbishop Adélard Langevin* of St Boniface, Man., to come to the Canadian west. From his first days in the United States, Abbé Gravel had been able to observe for himself the poverty of many of the French Canadians who had emigrated south of the border. He saw in Langevin’s request an opportunity to repatriate these exiles and help them benefit from the riches of the new provinces of Saskatchewan and Alberta, where the government was offering free land. At the end of September 1906 Gravel left for the west with his younger brother Émile. They stopped first in St Boniface; there Abbé Gravel was given a document authorizing him to found a parish “in the region of his choice.” Accompanied by a guide, they examined prospects in southern Saskatchewan and located 1,600 acres of unsurveyed land in the fertile valley of the La Vieille River (Notukeu Creek), 80 miles southwest of Moose Jaw. The five or six French Canadian squatter families already in the area would be the first settlers of the new parish. On 22 Feb. 1907 Gravel was named an immigration agent for the Canadian government and obtained four townships for the future colony of Gravelbourg. Ottawa assigned the new settlement a post office in March 1907: Gravelbourg was officially founded. Since the regional office of the Department of the Interior’s dominion lands branch was located in Moose Jaw, on the railway line, Gravel made this town his base. In the fall and winter he went east, stopping in St Boniface to consult with the archbishop, in Ottawa to solicit assistance from the government, and in Montreal to schedule interviews and launch newspaper appeals. He undertook lecture tours on colonization throughout the province of Quebec, and visited New York and the New England states in order to repatriate Franco-Americans, recruiting settlers even on board the train. Spring and summer were spent on the prairies. He was most often in Moose Jaw, welcoming and directing his new recruits; sometimes he even accompanied them to the land they had been granted. Moreover, he dealt with the numerous problems brought to him by the settlers as well as by many priests including those of Notre-Dame d’Auvergne (Ponteix), Le Pinto (Meyronne), Lac à la Plume (Pelletier Lake) and Gull Lake. He was also involved in the villages of Courval, Dollard, Mazenod, and Lafleche; he thus contributed a great deal (often in ways others never suspected) to the establishment and development of a francophone settlement in southern Saskatchewan, of which Gravelbourg was the centre. His letters and reports to William Duncan Scott, the superintendent of immigration in Ottawa, and to his bishop give some idea of the prodigious amount of work accomplished by this energetic man. On 18 March 1912, following the election of a Conservative government in Ottawa, Abbé Gravel, who was a fervent Liberal, lost his position. He still enjoyed the favour of the provincial Liberal government of Thomas Walter Scott*, however, and he decided to settle permanently in Gravelbourg. From the beginning, he had busied himself in obtaining essential services (wells, bridges, telegraph) for the settlement. He was also responsible for securing many other improvements, for example, a French-language land office in the village itself in 1910 and an immigration shed to house new settlers in 1911. There was still no railway, an essential for the development of the community and the surrounding area. The year 1913 saw the fruit of five years of requests to the railway companies and the various levels of government: on 20 September the first Canadian Northern train entered the Gravelbourg station. The village acquired the status of a rural municipality that year and became a town in 1917. In February 1918 Gravelbourg was made a judicial district. These developments, however, did not satisfy Abbé Gravel. He wanted to make Gravelbourg the French and Catholic cultural centre of Saskatchewan. To achieve this goal, the little town had to have schools and religious institutions. It was through his initiative and determination, and his powers of persuasion, that in 1915 the Religious of Jesus and Mary of Sillery, Que., established themselves in Gravelbourg, where they founded a convent that Gravel served as chaplain and patron. 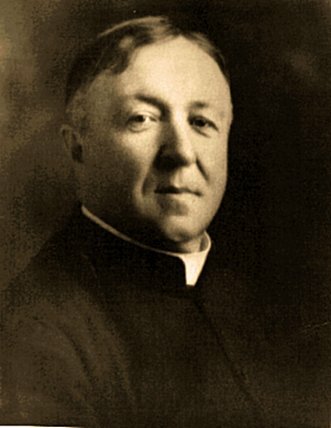 His tenacity and spirit were also responsible for the establishment in 1918 of a college, of which he was procurator for a time, as well as for the founding in 1920 of a elementary school directed by the Oblate Missionaries of the Sacred Heart and of Mary Immaculate. Gravel certainly benefited from the essential support of Archbishop Olivier-Elzéar Mathieu of Regina, and the encouragement of parish priest Charles-Adrien Maillard, but he himself was the driving force. He had to approach the Religious of Jesus and Mary twice to persuade them to come, and in 1917 it was he who requested and obtained from the provincial government the charters authorizing the creation of two Catholic colleges, one English-language, the future Campion College of Regina, and the other French-language, the Collège Catholique de Gravelbourg, which would later be called Collège Mathieu. On 23 Feb. 1923, after the Liberals had returned to power in Ottawa, Gravel was rehired as an immigration agent; in fact, he had hardly stopped doing this work. He was a builder in all senses of the word, and his papers include plans for an orphanage and an agricultural school. By 1909 he had begun thinking about establishing a hospital and from 1912 until 1925 he worked steadily toward this goal. Unfortunately, he would not live to see its completion. He had, however, prepared the way for his successors and he bequeathed a property to “the Corporation of the Gravelbourg hospital.” He died suddenly, on 10 Feb. 1926 at the age of 57, while on a trip to Montreal. His body was transported to Gravelbourg. Though the church could seat 2,000, it could not accommodate all those who came to attend his funeral. The eulogy was delivered by Archbishop Mathieu. Abbé Louis-Pierre Gravel devoted 20 years of his life to the cause of French, Catholic settlement. Like Father François-Xavier-Antoine Labelle*, to whom he has been compared, he lived and died for this cause. A monument erected to his memory in Gravelbourg in 1958 commemorates his work. The inscription reads: “Between 1906 and 1926 more than 10,000 Canadian citizens, many of whom were then living in the United States, answered the call of Reverend Louis-Pierre Gravel to make their homes on the broad plains of Saskatchewan where they built towns and established French-speaking cultural institutions.” His most precious legacy remains Gravelbourg, which carries his name. A copy of the Gravel family fonds, the originals of which are in the author’s possession, is available at ANQ-Q, M204. It consists of 510 files on 20 microfilm reels; Father Louis-Pierre Gravel’s papers make up the bulk of the collection (files 179–444, reels 9–18). A copy is also available at the Saskatchewan Arch. Board (Regina), R-9-48. Additional material concerning Gravel is scattered among several collections, among them the Arch. of the Diocese of Gravelbourg, Sask. ; the Fonds Langevin in the Arch. de l’Archevêché de Saint-Boniface, Winnipeg; and the records from the period of O.-E. Mathieu’s installation as bishop in 1911 in the Arch. of the Archdiocese of Regina. Material at the NA includes Gravel’s reports as immigration agent to the federal superintendent of immigration, W. D. Scott (MG 26, G: 13703–6 and RG 76, Acc. 1969/017, box 213, file 595025-2). J. H. Archer, Saskatchewan: a history (Saskatoon, 1980). Adrien Chabot, History of the diocese of Gravelbourg, 1930–1980 (n.p., 1981). 1915–1965, souvenirs: album souvenir pour marquer le cinquantième anniversaire de la fondation du couvent des religieuses de Jésus-Marie à Gravelbourg ([Gravelbourg?, 1965?]). Les Gravel, Lucienne Gravel, édit. (Montréal, 1979). Georges Hébert, Les débuts de Gravelbourg: son fondateur, ses pionniers, les institutions, 1905–1965 (Gravelbourg, 1965). Heritage: Gravelbourg – district, 1906–1985 (Gravelbourg, 1987). Historical sketches of the parishes of the diocese of Gravelbourg, Sask., on the occasion of its silver jubilee, 1930–1955 ([Gravelbourg, 1956]). Ernest Laforce, Bâtisseurs de pays (3v., Montréal, 1944–48). Richard Lapointe, 100 noms: petit dictionnaire biographique des Franco-Canadiens de la Saskatchewan (Regina, 1988). Richard Lapointe and Lucille Tessier, The francophones of Saskatchewan: a history, trans. Lucille Tessier (Regina, 1986). Robert Painchaud, Un rêve français dans le peuplement de la prairie (Saint-Boniface, 1987). La Saskatchewan de A à Z, Richard Lapointe, compil. (Regina, 1987). Ghislaine Gravel Bernier, “GRAVEL, LOUIS-PIERRE (baptized Louis-Joseph-Cyriaque),” in Dictionary of Canadian Biography, vol. 15, University of Toronto/Université Laval, 2003–, accessed April 26, 2019, http://www.biographi.ca/en/bio/gravel_louis_pierre_15E.html.